The world record for the deepest SCUBA dive lies at 1,089 ft (332 meters). 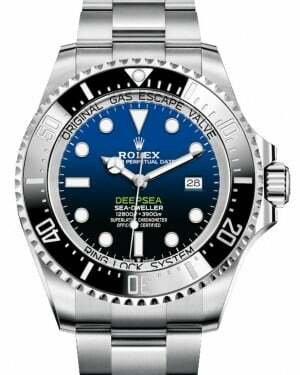 The Rolex Deepsea can go much deeper - up to 12,800 feet (3,900 meters). That might not be enough to go all the way down the Mariana Trench, but it's more then enough for professional Helium-Deep-Divers. Similar to the Submariner, this watch offers an elegant, easy-to-read dial and a bezel which allows you to keep track of your time underwater. The Deepsea also has a special valve to let out Helium during the decompression process when divers are resurfacing. 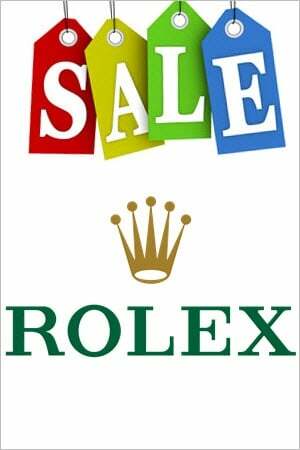 With its high profile you can be sure to turn heads as you walk by with the Rolex Deepsea. 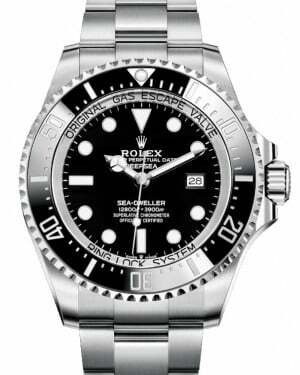 Technically speaking, the Rolex Deepsea is one of the youngest models in the Rolex catalogue, with its first model being released as recently as 2008. With that being said, the collection shares its origins with the Rolex Sea-Dweller, first released in 1967, which is why the words 'Sea-Dweller' appear on the dial. Much like its predecessor, the Rolex Deepsea has been designed to accommodate the highly advanced needs of professional divers and other deep-sea explorers, resulting in extremely high water resistance. In this article, we take a more detailed look at the short history of the collection up until this point, as well as its main features. 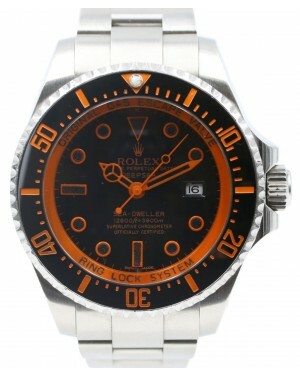 The first Deepsea model, Reference 116660, was released in 2008 under the name Rolex Oyster Perpetual Date Sea-Dweller DEEPSEA. Aesthetically, the model had much in common with earlier Sea-Dweller models, including its round case shape, rotatable bezel and date display window at the 3 o'clock position. Perhaps the most notable visual change was the size of the case, which increased from the 40mm case size associated with the Sea-Dweller, to a larger 44mm. It still featured the patented helium escape valve, and was primarily constructed from stainless steel, with a black ceramic bezel and clean black dial face. Most impressively, the watch offered water resistance at depths of up to 3,900 metres, or 12,800 feet, below the surface. This made it the world's most water resistant watch in regular production, and also meant it could safely be used at a depth of more than ten times the current world record for the deepest scuba dive. In 2012, film director James Cameron piloted a submersible vessel, the Deepsea Challenger, to a depth of around 11,000 metres below the surface of the Pacific Ocean. This marked only the second manned dive to reach the deepest known point on earth, Challenger Deep, and the mission was filmed for the movie Deepsea Challenge 3D. 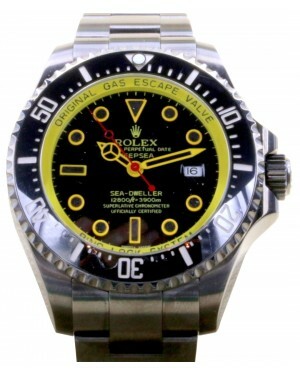 As part of the project, Rolex produced a special prototype model of its Deepsea watch, entitled the Oyster Perpetual Date Sea-Dweller DEEPSEA CHALLENGE. It was designed to be water resistant for 12,000 metres, or 39,370 feet and was strapped to the manipulator arm of the vessel for the duration of the dive, ultimately surviving in tact. To commemorate the accomplishment, Rolex released a new version of the Reference 116660 in 2014 - the Deepsea D-Blue Dial. 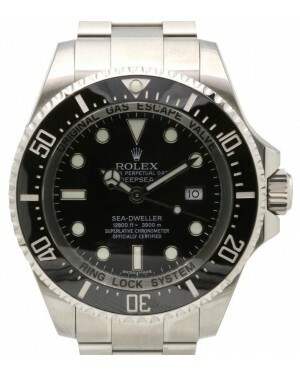 While it is technically identical to the original, it features a two-tone dial, which fades from blue to black, while the word 'Deepsea' is written in green, which was the colour of James Cameron's vessel. 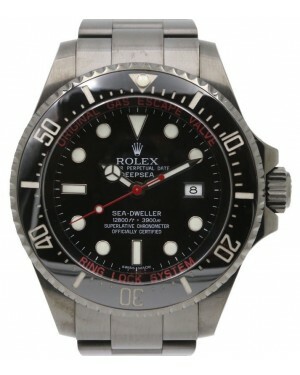 This particular model is often referred to as the Deepsea James Cameron by collectors.